This beautiful one bedroom oceanfront unit is located on the third floor of the 'A' Building at Papakea Resort and is approximately 50 feet from the ocean. Papakea is a beautifully landscaped, low rise complex (4-story) that includes 2 swimming pools, 12 gas operated barbecues, 2 hot tubs, 2 twelve hole putting greens, 2 shuffleboard courts, 2 lighted tennis courts, and many more extras. The condo sleeps 4 (California king size bed in the bedroom and a queen-size sofa bed in the living room) and is equipped with everything that you will need. The unit is clean and well maintained. The condo is NOT AIR CONDITIONED. The unit has a high efficiency ceiling fan in the bedroom and the living room. The sliding door (screened) to the lanai can be left open all night to allow a cooling breeze and let you enjoy the sounds of the ocean. The unit offers complete privacy since the only people that can see into the unit are on Molokai (nine miles across the Pailolo channel). The bathroom has been completely remodeled and the kitchen was completely remodeled with granite counter tops, wood cabinets and drawers, a new stainless steel refrigerator, dishwasher and over-the-range microwave oven. Watch the famous Maui sunsets from your private lanai. The whales are frequent visitors to the Papakea waters and you can watch them play while you relax on the lanai (whale 'season' is approximately from the end of November to the end of March). We provide 'check-in' cleaning only; no daily maid service. No extra charges for cleaning. The Papakea Board of Directors has implemented a 'Facilities Fee'. Effective July 1, 2016, the fee is $17.00 per night for the first ten nights of each consecutive 30 day period. The fee (not included in my rates) is payable at the front desk at check out. Jerry & Jane Mapes (owner since 1986). Papakea Resort is the perfect place for your Hawaiian vacation. The grounds are beautifully landscaped and maintained. The low rise buildings (4 floors) on the spacious grounds (13 acres),allow you to enjoy Maui without having to endure a high rise hotel atmosphere. 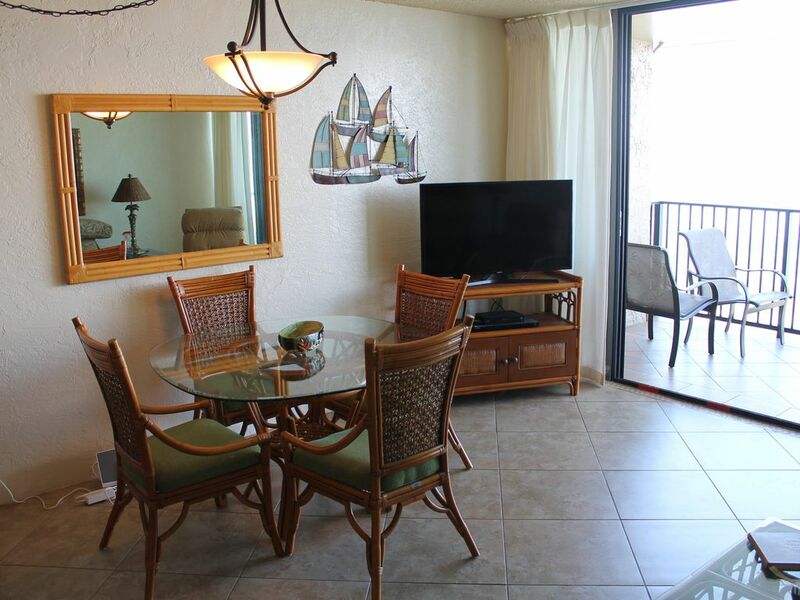 Our condo, only 50 feet from the ocean, provides everything that you will need to enjoy a perfect Maui vacation. You can see the mountains on the islands of Molokai and Lanai from the lanai. The ocean is 50 feet from the condo. Charge for long distance calls. Bring your cell phone or calling card. New Asko washing machine and dryer installed in February 2017. Washer and dryer located in condo. Free wireless Internet access is provided. Over-the-range stainless steel microwave oven. Dining table with 4 chairs. New 2018 Samsung 43 inch smart TV. Snorkel equipment and boogie boards in condo. Two twelve hole putting greens are available for guests. (2) Papakea has two heated salt water swimming pools for guests. Remodeled kitchen with granite counter tops, wood cabinets and drawers. Dishwasher, refrigerator and microwave oven. New washing machine and dryer in the condo. All linens and dinnerware are provided. Many small appliances are provided for your convenience. Pools (2), gas BBQs, hot tubs, putting greens & tennis courts (3) are available for guests at no additional charge, Free parking, Sorry, pets are not allowed at Papakea, There are no additional cleaning fees, Free wireless Internet access. Had the pleasure of staying in this unit over the Christmas holidays and we were not disappointed. The view is out of this world. Loved watching the whales from out lanai. Unit was clean, bed was comfortable and had was equipped with everything we needed. Loved the complex, never crowded and enjoyed the lounge chairs on the lawn. Great places to eat all within walking distance and Farmers Market on Mon,Wed andFriday. Would stay at this complex again. Property was very nice and clean. Everything we needed and wanted for our stay. A beautiful condo. Gourmet kitchen....but watch those knives; they are sharp! And the toys are there too; pool noodles, fins, golf clubs and balls etc. The owner responds quickly and efficiently if you have questions. Grounds are very prey and well maintained. I would love to return. Absolutely nothing but great things to say. We truly enjoyed our vacation at Papakea resort. The condo was perfect for the 3 of us. We had everything we needed for our 6 night stay. The property is kept up nicely and it’s not crowded like other properties we’ve visited before. Well- maintained, serene, ocean front paradise! Great stay! Great value for being right on the water. Boating and Surfing, Kapalua & Kaanapali Golf Courses nearby. All rates plus Hawaii state taxes. The Papakea Board of Directors has implemented a "Facilities Fee" effective July 1, 2014. The fee is $17.00 per night for the first ten nights of each consecutive 30 day period. The fee (not included in my rates) is payable at the front desk at check out. Reservations cancelled with at least 60 days notice will receive their reservation deposit back. Cancellations with less than 60 days notice will receive 50% of their deposit back.